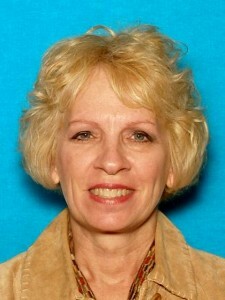 58 year old Patricia Ann Hallsted has been missing since Saturday morning, December 8, 2012 in Plano, TX. Patricia Ann Hallsted was last reported seen when she left her home in the 6900 block of Rochelle Drive near Coit Road and Legacy Drive at about 11 am. She has not been seen or heard from since. Hallsted was in a 2008 black, four-door Toyota Camry with a spoiler and Texas license plate DX2X842, police said. Hallsted is white, 5 feet 4 inches tall, weighs about 130 pounds, has blond hair and blue eyes, and has a small fleur-de-lis tattoo on her inner right wrist, police said. If anyone has seen or has any information on Hallsted’s whereabouts, please call Plano police at 972-424-5678.